Cinteotl - God of the maize. - Aztec God. Cinteotl Centeotl Centeocihuatl is the God of the maize. 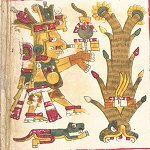 Home ¦ Divinity of the Day ¦ Aztec Gods and Goddesses ¦ Cinteotl - God of the maize. Cinteotl - God of the maize. Cinteotl (Centeotl, Centeocihuatl) is the God of the maize. Centeotl is the son of the earth goddess, Tlazolteotl and solar deity Piltzintecuhtli, the planet Mercury. He is usually portrayed as a young man with yellow skin. In the sacred calendar, Centeotl is the Lord of the Day for days with number seven and he is the fourth Lord of the Night.